Grab out just a few essential supplies and a few moments of your time and you're set to go with this one. 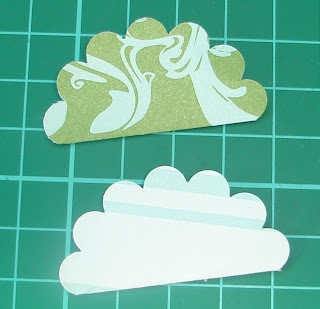 When you get started with these tree decorations you'll find you've made a dozen in just a few minutes. 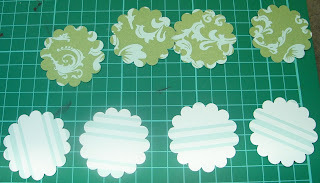 Punch out eight scallop circles from your double sided patterned paper. You can use any even number of scallops in your decoration. Fold your scallop circle in half and score the fold. Using adhesive between each scallop, I used double sided tape, layer each scallop on top of each other alternately the patterns. This is what the straight edge should look like. 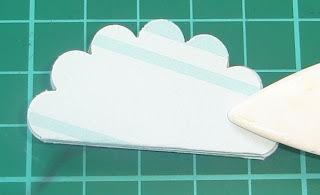 Fold a length of Linen Thread of fine ribbon in half to form a loop suitable for hanging your decoration and attach to the straight edge as shown in the photo above with double sided tape. Thread beads on both ends and tie a knot to hold them in place. 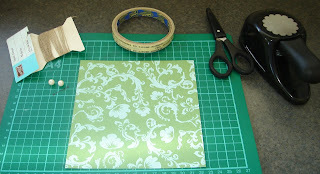 Attach the sides of the sandwich together to form a circle with double sided tape. 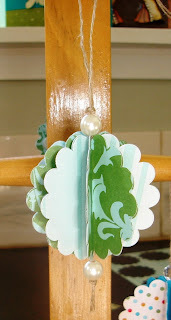 Trim ribbon ends and hang.